Your PC was working fine yesterday, but then you moved it, and now it won't boot. A loose component could be the culprit. The jostling a system endures during a move-especially one involving a long car ride-can unseat internal components from their slots. Ground yourself. Before you unplug the computer, touch metal. Then move your system to an uncarpeted area, if necessary, before opening the case. And wear an antistatic wrist strap if you have one. Open the case and begin hunting for the offending part. Perhaps something looks physically amiss, hanging out at an odd angle. If so, you know exactly where to zero in. More often, however, you'll have to fix the problem by unplugging and reattaching parts. Start with the PCI cards and RAM. 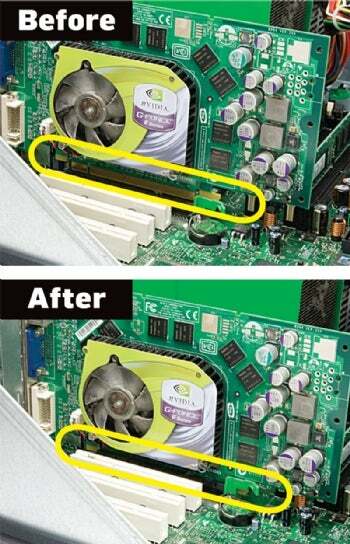 Unscrew each PCI or other card you use, in turn, and lift it straight out of its slot. Watch for a plastic release tab or other lever that you might have to bend first (these are most common on slots for video cards). Handle all components by their edges; oils in your skin could cause damage if you directly touch exposed surfaces. Before: a board with a loose card. After: the same card, reseated. Once you've cleared the slot, push the card straight back in. It should slide down without your having to rock it in any direction, landing with a satisfying thunk. Repeat these steps with RAM. Most motherboards release their RAM modules if you pull apart levers on the modules' edges. Do that, and lift the RAM straight up. Leave the levers in the open position once the RAM is out. Push the RAM module straight down, again without rocking, to reinstall it. The levers will snap to their closed position. Be gentle; don't force in any PC parts. Close the case, and try booting up the PC. If it still won't start, open it back up, and unplug and then reconnect all of the in­­ternal cables. If you still have problems, try connecting only the most basic cards and components, such as the original RAM. If this works, successively add the disconnected parts back in to see if one of them-or its slot-is malfunctioning. If the battery runs down, you can replace it yourself. A frozen, unresponsive pixel can drive you crazy. These tricks may fix it. So your phone got all wet? You might be able to rescue it. Here's how. By working fast, you can save your laptop from the effects of a coffee spill. Moving a PC can loosen internal components. You can fix that. Some irregular CDs can get stuck. Here's how to get one out. Port openings can get dirty. Here's how to clean them. Grime can build up in a desktop PC. Here's how to clean the case.